Introduction: Byzantine culture is dominated by the Christian religion. Images of Christ and the Virgin, prophets and saints, plus a more or less developed iconographic cycle of religious feasts constitute the overwhelming majority of Byzantine art, to the extent that the life and deeds of normal people seem almost invisible. How did the inhabitants of the Byzantine empire live? What did they wear and what did they eat? These are issues infrequently dealt with in Byzantine studies but this is not due to lack of interest on behalf of scholars. The main problem is the nature of extant material. The amount of secular that has survived is negligible, while excavations of early Christian and Byzantine sites, which normally produce numerous specimens of material culture, are fewer and not always as well documented as, for example, those of the classical era. However, one aspect of everyday life can be studied even through religious art is that of costume. Dress codes and trends can be examined mainly through images of secular figures included in painted churches or illuminated manuscripts. These are usually donor portraits and depict people who funded the building of a church and its fresco decoration, the painting of an icon or the commission of a manuscript. They abound in the late Byzantine period and offer a precious testimony of what Byzantine men and women wore. 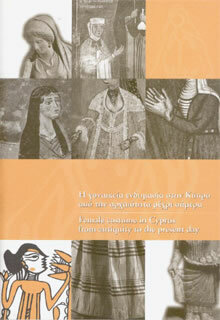 Cyprus offers ample evidence for the way people dressed in medieval times. Such testimony is preserved in a variety of media: frescoes, icons, effigial slabs and manuscripts. The majority of the material dates from the period of the Lusignan and Venetian rule, which is not surprising, given the habit of depicting laymen as donors spread widely in the Byzantine world from the twelfth and thirteenth centuries onwards. As for the same practice in icons, it is mainly attested in Western works of art.